Gentek Siding offers Sequoia Select. A departure from ordinary vinyl siding. Sequoia is a versatile collection featuring elegant, classic hues as well as distintive variegated colores with intertwining earth tones-for a richness and warmth no other siding can match. Masterfully crafted with attention to every detail, this performance-engineered home exterior will meet your every expectation for outstanding beauty, enduring protection, easy upkeep and lasting value. 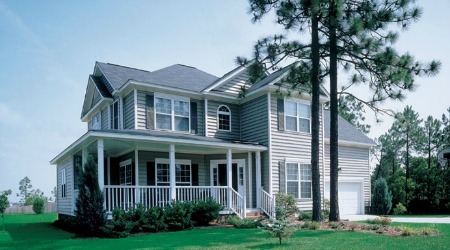 Gentek offers a wide variety of traditional lap or clapboard siding styles. Premium quality sidings that stand up to harsh weather and violent winds. Comes in all the popular vinyl siding styles. Clapboards, Dutch Lap and Board and Batten. Extra-Heavy Wall Thickness: Heavy-duty .046" thickness provides superior rigidity, ensuring straight, smooth walls. Full - Roll Nailing Hem: Provides double-strength wall attachment. Exclusive Advantage Lock System: Securely connects panels, greatly enhancing rigidity and stability. Hurricane-Velocity Wind Resistance: Withstood wind loads up to 253 mph in independent tests. Rich Cedar Grain Emboss Textures: Beautiful low-gloss finish achieves natural appeal and excellent durability and requires minimal upkeep. Comes in a wide array of colors. Classic, Designer and Variegated. 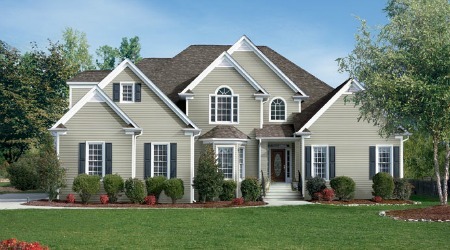 To Go Back to Vinyl Siding Manufacturers click here. Classic old-world style. The extra deep beaded ridge and inviting brushed texture of this 6-1/2" profile will give your home the ideal touch of character and charm. Click here to review more about Gentek Beaded Siding. Insulated siding offers an energy saving option for areas where weather is a concern. Insulated siding adds warmth and comfort to you home. Energy-Saving-Technology: Fully integrated, custom-contoured 1-1/2" insulation creates a blanket of thermal protection to shield your home from inclement weather and energy loss. Greater Impact Resistance: Up to 400% more impact resistance than conventional siding for superior strength and a beautifully uniform finish. 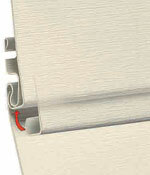 Exclusive Advantage Lock System: Interlocking design secures panels in place, greatly enhancing rigidity and stability. Full-Roll Nail Hem: Heavy-duty, double-strength wall attachment increases strength and structural integrity to help bridge uneven wall surfaces. Superior 3/4" Lap Height: Rigid panel projection creates a deeper dimensional look with enhanced shadow lines and a handcrafted appearance. Built Hurricane-Tough: Laboratory tested to withstand winds up to Category 5 Hurricane rating. Quite Comfort: High density insulation and integrated panel design soften outside noise. Beautiful Wood-Like Appearance: Natural Cedar Wood Grain texture and subtle detail create a true-wood look. Easy Color Match System makes it easy for you to find the perfect color combinations. To review more about Insulated Vinyl Siding click here. To review more information on siding, go to home page All-About-Siding, click here.